The Cutera Titan uses light energy to heat the dermis deep beneath your skin’s surface. Without surgery, recovery time, or injections. 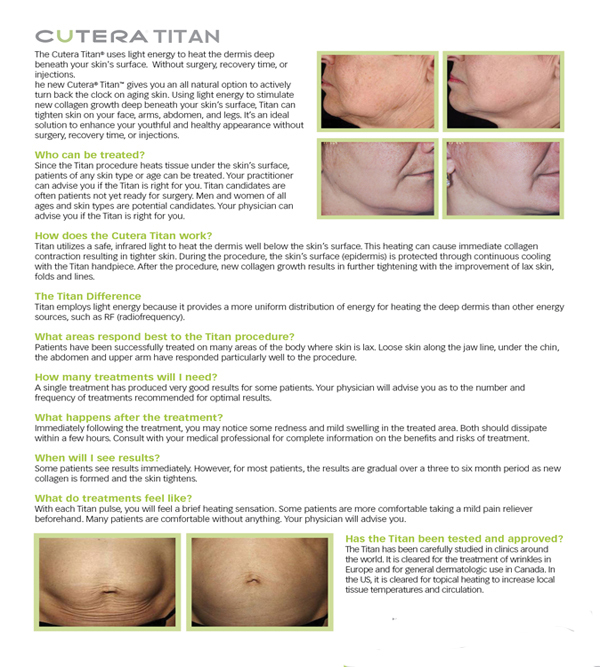 The new Cutera Titan gives you an all natural option to actively turn back the clock on aging skin. Using light energy to stimulate new collagen growth deep beneath your skin’s surface. Titan can tighten skin on your face, arms, abdomen, and legs. It’s an ideal solution to enhance your youthful and healthy appearance without surgery, recovery time, or injections. Since the Titan procedure heats tissue under skin’s surface, patients of any skin type or age can be treated. Your practitioner can advise you if the Titan is right for you. Titan candidates are often patients not yet ready for surgery. Men and women of all ages and skin types are potential candidates. Your physician can advise you if the Titan is right for you. What area respond best to the Titan procedure? A single treatment has produced very good results for some patients. Your physician will advise you as to the number of frequency of treatments recommended for optimal results. Immediately following the treatment, you may notice some redness and mild swelling in the treated are. Both should dissipate within a few hours. Consult your medical professional for complete information on the benefits and risks of treatment. The Titan has been carefully studied in clinics around the world. It is cleared for the treatment of wrinkles in Europe and for general dermatologic use in Canada. in the US, it is cleared for topical heating to increase local tissue temperature and circulation.